Mary Cassatt (Mary Cassatt may 22 1844 — June 14, 1926) is an American painter and printmaker, feminist, and knight of the Legion of honor, one of the three "Grand ladies of impressionism". Her life, she tied with France, but always remained a true American — a strong, independent, with a keen sense of justice. The daughter of a millionaire was destined to a carefree future. 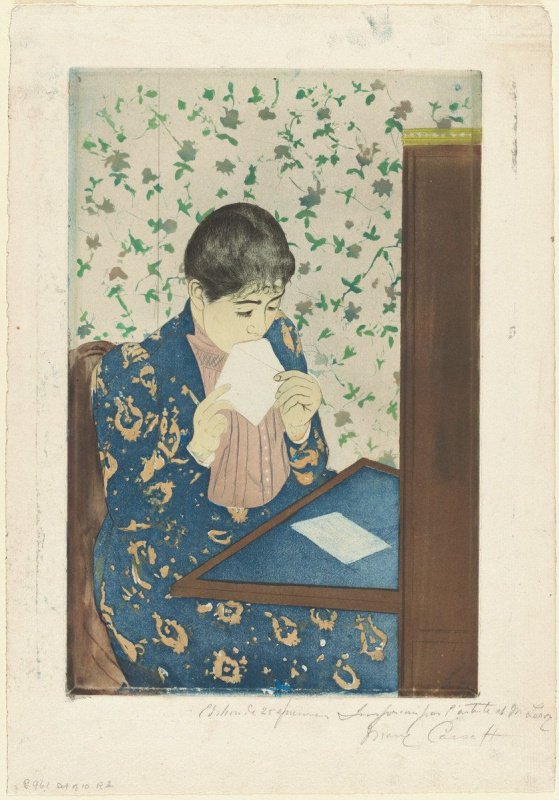 But Mary Cassatt chose a difficult way of the artist, where resistance was met more often than support. She has created many deep female characters, glorified motherhood, but their children, and my husband, she never had. 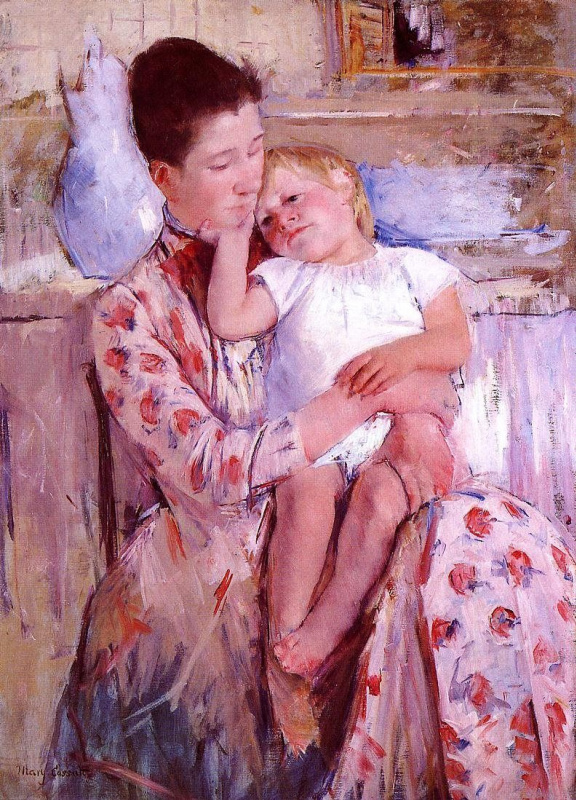 Mary Cassatt was born in Pennsylvania, the city of Allegheny, in the family of a successful broker dealer and the land of Robert Cassatt and the daughter of a banker Katherine Kelso Johnston. Her mother was an educated and energetic woman, had a greater impact on the Outlook of the future artist. When Mary was 7 years old, cassata cake went to Europe. They traveled for almost 5 years: lived in Paris, London, Berlin. Stayed in Darmstadt — the elder brother of Mary Alexander, the future President of the Pennsylvania Railways, studied there engineering. The girl learned French and German, received the first lessons of music and drawing. In 1855 at the world exhibition in Paris, she saw the work Ingres, Corot, Delacroixand other contemporary painters. Mary was 11, and she’s already decided who he wants to be. By the time the cassata cake moved to Philadelphia, where the Pennsylvania Academy of the fine arts. Teenager Mary was determined to study there. For Puritan America it was a challenge. Contemporary Cassatt was educated at home, is necessary to attract prominent suitors, and did not think about any audience. In the Academy the girls with difficulty were allowed to attend classes only three times a week. Rebel stood his ground. In the end, the parents hired a teacher, who prepared her for the admission. 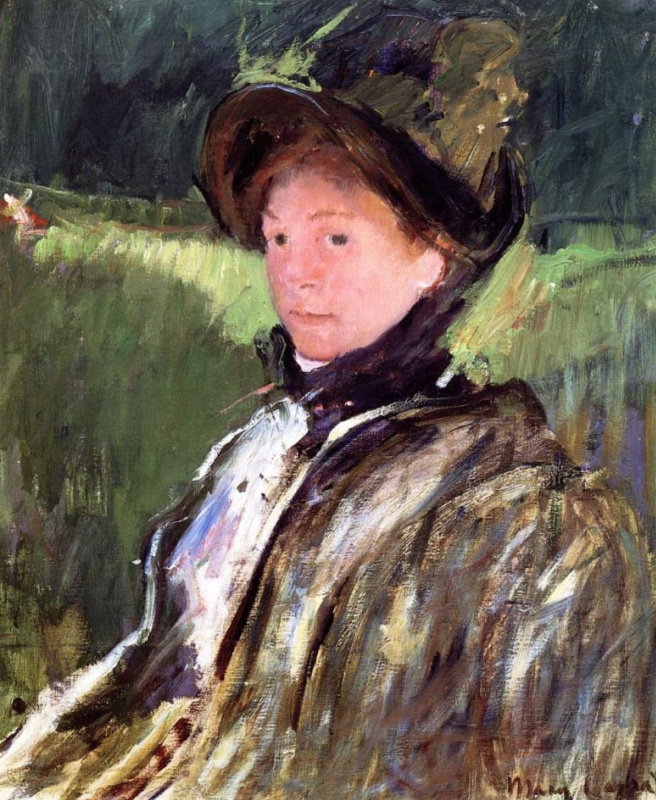 Cassatt was only 15. Later she says that the study itself was not. The lessons were boring. The attitude of the girls of the male teachers was condescending. Students are not even allowed to draw Nudes. Nascent feminism has acquired an ardent supporter. After the war, Mary decided to continue her education in Paris. There followed a series of domestic scandals. During another lecture on the purpose of the woman Cassatt stated that refusing marriage and children, and fully devoted himself to painting. Only a year later the father sent Mary with her mother and sister Lydia as companions. Since the Paris School of fine arts did not accept women, 22-year-old Mary copied works in the Louvre, he took private lessons from masters of academic style and to get accustomed to the "revolutionary" painting Manetand Courbetrejected by the Paris salon. Meanwhile, the Cassatt salon noticed — in 1868, the jury selected for exhibition her painting "Mandolinata". With the beginning of the Franco-Prussian war, Mary still had to go home. Father never made peace with her choice. He paid for the basic needs of his daughter, but refused to Fund the painting. Americans paintings Cassatt did not buy. Two of her works were burned during the Great Chicago fire of 1871… the Artist became depressed and put his brushes aside. Now known only to two works of the first period of her work. Salvation came unexpectedly in the person of the Archbishop of Pittsburgh. He ordered Mary copies of paintings Correggiolocated in Parma, and in 1871, Cassatt went to Italy. There she learned that the exhibition of the Paris salon of 1872 bought her painting "Two girls throwing flowers during carnival". The talented artist spoke all of Parma. 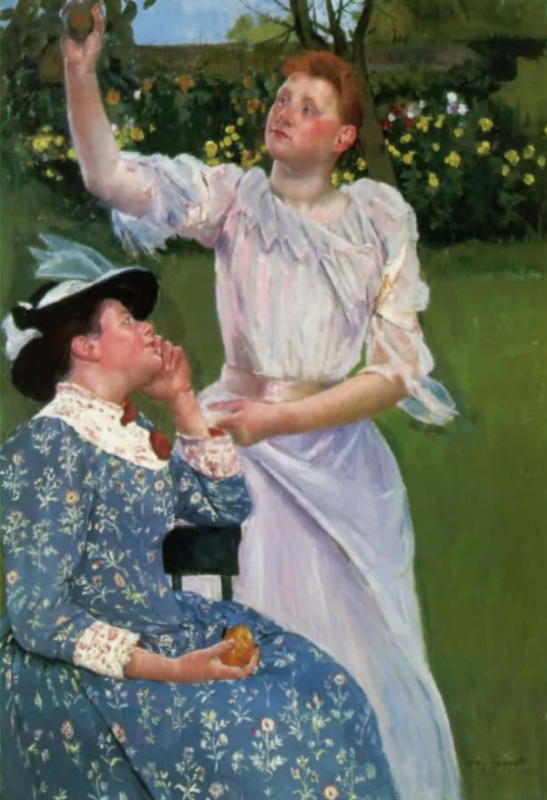 After completing the order, Cassatt traveled to Spain, Belgium and Holland, where he continued to take lessons, study the old masters and to hone your own skills. In Madrid and Seville, she wrote a series of Spanish paintings. 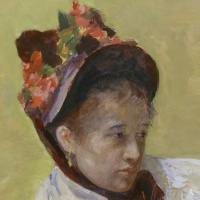 An example for Cassatt served as the canvases of Manet, who skillfully used the techniques of the classical school in modern painting. By 1873, when Mary returned to Paris, she had already decided that won’t work in the "unnatural and sleek" academic manner. It was 1874. Cassatt was in a creative search when a difference in two weeks have seen two important developments. On the Boulevard des Capucines was opened the first exhibition Batignolle group of artists later called Impressionists. Among the participants were Monet, Renoir, Degas, Cezanne. New painting, with its sincerity and bright colors captivated by Cassatt. Imitating Monet, she painted a picture "The girls pick the wild poppies". The artist began to travel in the open air, have dreamed of during training in the US and has never left the notebook doing sketches. Soon opened the Paris salon. Edgar Degas saw the painting Mary "IDA"that "crush him to the heart". A year later, Cassatt, as a foreigner, stood at the window of the shop where put up for sale pastels of Degas. "It changed my life. I saw art as I wanted to see him"— she wrote to a friend. Correspondence love artists lasted about three years. When they were finally introduced, Degas threshold invited Cassatt to exhibit with the Impressionists, and she said Yes without hesitation. By the time the Paris salon several times rejected the work of Cassatt. The paintings of women who did not have patrons in the jury, constantly finding fault. But the thought of having to flirt with men for the sake of winning favor, was for Mary gross. Impressionist exhibition, held in 1879, was the most successful in the history of the movement. Joined the group Cassatt sold several. The money she secretly bought two paintings — a Monet and a Degas. 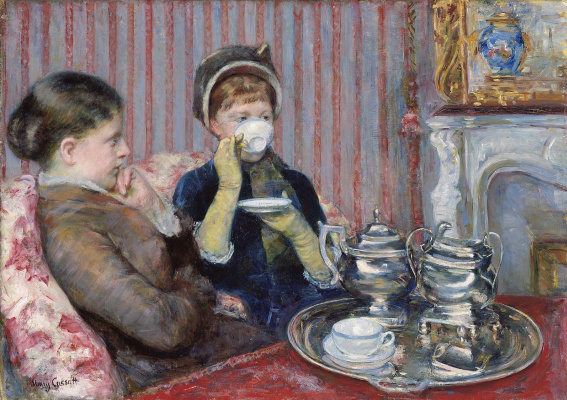 Degas became the main mentor to Cassatt. The artists had a lot in common: they came from wealthy families, studied in Italy, was independent, had similar views on art. Degas often accompanied by Cassatt during trips to the Louvre and wrote a few portraits of the artist at work (1, 2). 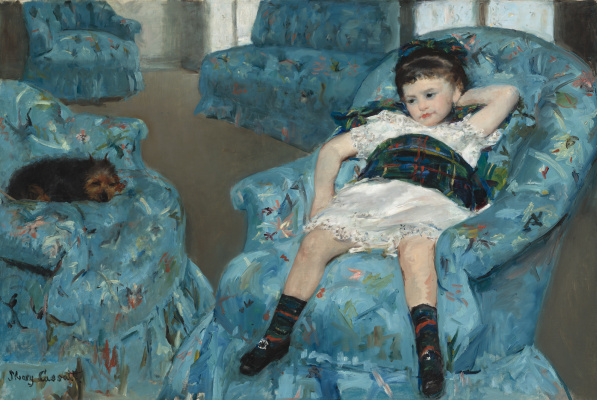 He was helping a younger colleague to learn the technique of pastels and engravings, and Cassatt, in turn, "promoted" his paintings in the United States. Although they spent a lot of time together working in the workshop Cassatt, intimacy between them was not. The artist did not break his vow. Reliable information about his personal life, Degas no, but most biographers agree that he refrained from relations with women. Joining the Impressionists, Cassatt took a deep breath. But soon, she had family troubles, because of which the painting receded into the background. In 1877, arrived in Paris Cassatt parents with a sick sister. Mary selflessly cared for Lydia, but the disease has receded, and 5 years later the sister died. Shortly before that came the brother of Alexander with the family. Mary was often depicted family: "Lydia crocheting in the garden at Marly"(1880), "Reading Le Figaro"(a portrait of his mother, 1878), "Alexander George. Cassatt and his son Robert Kelso Cassatt"(1885). Another passion of the artist was a theatrical subjects, is very popular among Impressionists. Cassatt took part in four impressionist exhibitions, including the latest, 1886-year. Then the artist moved away from impressionism and never considered himself to any artistic movement. In 1891 the gallery Paul Durand-Ruelopened the first exhibition of the artist. The Central part of the exhibition was 10 fine engravings in the Japanese style. 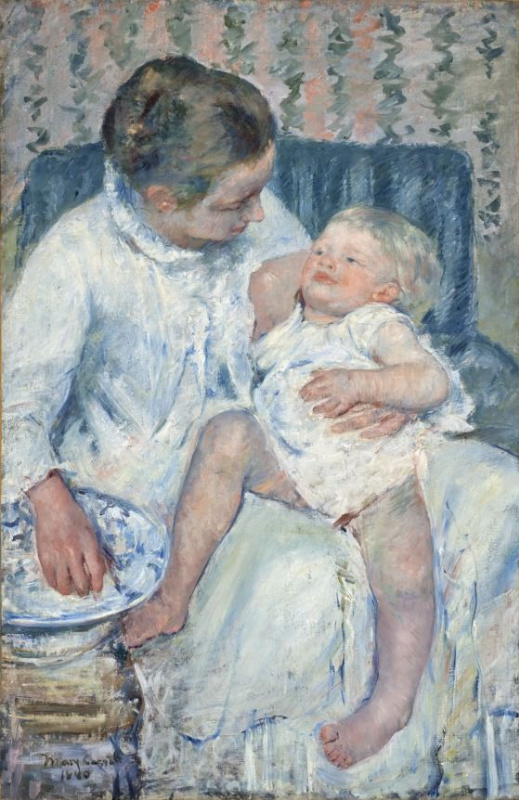 Following this, Cassatt created a number of masterpieces depicting women and children: "Baby bathing"(1893), "Summertime"(1894), "Boat trip"(1894), "Breakfast in bed"(1897). 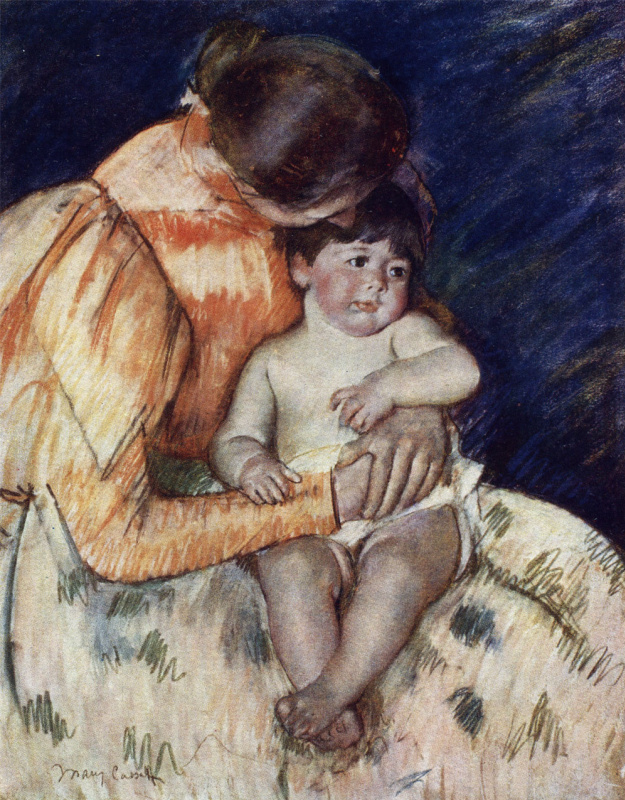 By the end of the century, Cassatt has received recognition not only in France, but also in their homeland. 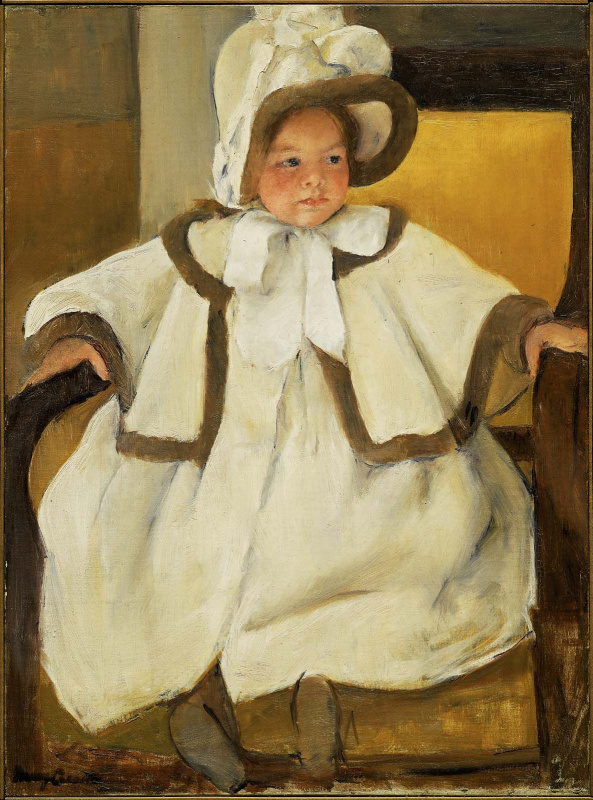 Young American artists imitated her collectors consulted and persuaded Cassatt, donated paintings to museums in the United States. The income of the artist has increased, and in 1893, she acquired an old mansion in the outskirts of Paris. Alas, the love of the public was fleeting. 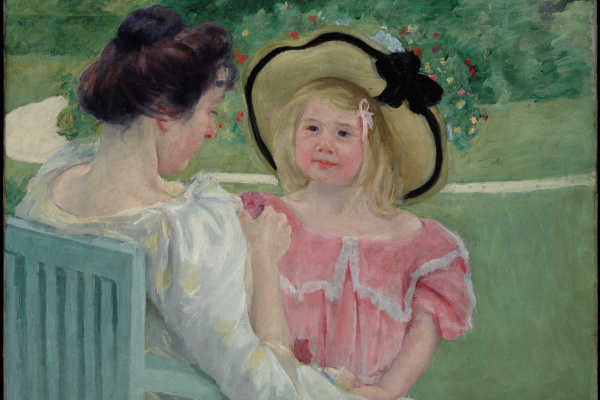 In 1899, he returned to France after six months of stay in the United States, Cassatt found that it had cooled. The fashion was post-impressionism, Fauvism and cubism. The artist did not adapt to the changeable tastes of Bohemia. She continued to work in his manner, as long as health permitted. Recent paintings Cassatt dated to the middle 10 years — by this time she was almost blind. Having survived all his friends, the artist died alone, aged 82. All her life she supported the movement for women’s rights. Was one of those who created in the art image of the new woman — smart and socially active. This world knows itself and Mary Cassatt.